DriftBuster is powered by a four-stroke pressure-lubricated gasoline or diesel engine and commercial drives. The snow thrower is available in 48- and 60-inch models. The 7-gauge steel auger can cut through snow and ice at a high velocity, channeling it through an adjustable chute and throwing it up to 30 feet away. 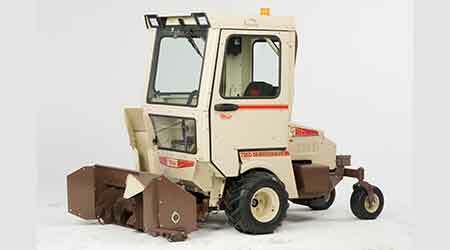 The snow thrower features a fully-enclosed metal winter cab, available for 700 and 900 series. The cab provides protection from wintery conditions and includes LED lights, electric windshield wiper and tilt levers. Additional options for the metal winter cab include a roof-mounted yellow strobe beacon light and, for liquid-cooled power units, a 16,000 Btu heater kit.